When the Ivorian Minister of Higher Education and Scientific Research Ibrahim Cisse Bacongo visited the University of Cocody in Abidjan, Côte d’Ivoire one Monday last May, he was greeted by a gathering of angry students. He had come to the campus of the University of Felix Houphouet-Boigny of Cocody to attend a symposium. The students took the opportunity to demand better studying conditions and to report the effects of corruption on their daily life. Some carried signs “enough is enough”; others chanted “Bacongo thief, thug Bacongo”. The minister tried to address the crowd, but they surrounded him. He was eventually escorted away to a building protected by the police, who then dispersed the crowd with tear gas. 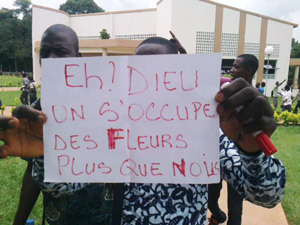 The University of Cocody, which has more than 50,000 students, was closed during the post-election crisis in 2010-2011. When it reopened in September 2012 several buildings had supposedly been renovated by the new government. The new buildings sparked a wave of hope, but soon that hope turned to disappointment. Instead of building new amphitheatres, the old ones had received some surface renovations. The high quality equipment promised was actually only cheap hardware that was completely damaged within two months of use. Furthermore, the auditoriums and rooms lacked air-conditioning and sound systems. Students from the faculties of science complained that they had not received any equipment for their laboratories; even the Wi-Fi connection is lacking. Some buildings still lack water and electricity. For example, at the law school, only one toilet works for about 8,000 students. No internal transportation exists for the university, which covers an area of ​​200 hectares. These issues have made many question whether the CFA 110 billion (US$226 million) that was earmarked for higher education was really spent on the renovation of the country’s universities. In January 2013, a report showed that there had indeed been embezzlement. The Director of Administrative and Financial Affairs Department was dismissed and an investigation was ordered by the president of the country into abuses at Abidjan University. The results have not yet been published. If the government recognises that funds were misappropriated, it has not taken any visible action to address the shoddy construction and other problems. For example, two second year law students recently fainted in class due to lack of space: the auditorium was built for 350 students but packed with 700, and had poor air-conditioning. This banner translates to “… they take care of flowers more than they take care of us”. At the same school, the malfunction or failure of the sound equipment often interrupts classes. Students sometimes have to fight for chairs or take notes while standing. The school library exists in name only; it has no books. There are no toilets or running water in many buildings. The transportation provided for students is also inadequate, so much so that accidents happen. It is reported that a student had to have one leg was amputated following a stampede at the bus stop. So far no action has been taken to improve the situation; what is worse, some students have been punished for protesting conditions. After the Bacongo demonstration in May, many of the protesters were given a reprimand that effectively resulted in their scholarships being withdrawn. Some also reported they were subjected to intimidation and threats. 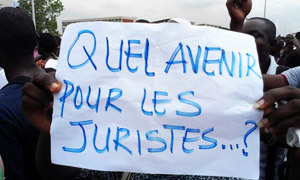 Ivorian civil society groups have complained about these conditions and there is some hope for change. We had a joint meeting after the May visit and we have demanded the government address the problem of corruption to prevent future embezzlement at the country’s universities. I hope our demand will be heard. 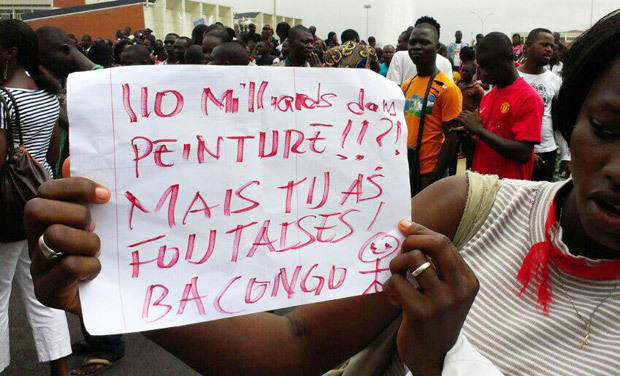 A student holding a sign saying “110 billion spent on painting? You gotta be kidding me Bacongo”.